While climate change can certainly exacerbate drought conditions, leading to more frequent wildfires, this year’s ferocious fire season might also have been heavily influenced by the El Niño event developing in the Pacific Ocean. On October 4, 2015, satellite images revealed that there were over 900 fires burning in the Brazilian Amazon. That figure was reported by Brazil’s Institute for Space Research, known as INPE, which said that the region most affected by the fires was the northern state of Amazonas. Some 11,114 forest fires have already been observed in Amazonas this year, a 47 percent increase over the same period last year, according to INPE. Amazonas is not alone in dealing with increased incidence of forest fires. More than a quarter of the fires so far this year have occurred in the Cerrado agricultural region, which encompasses parts of the central states of Mato Grosso, Mato Grosso do Sul, Tocantins and Minas Gerais, for instance. Meanwhile, Brazil’s southeastern states have been suffering from extreme drought, and a study by researchers at the Carnegie Institution for Science at Stanford University determined that the area of the Amazon affected by mild to severe drought is likely to double in the eastern part of Amazonia and triple in the west by 2100, due largely to the impacts of deforestation. The Carnegie Institution researchers did not factor rising global temperatures into their calculations, however, meaning drought conditions are likely to be even worse than they projected. That does not bode well for future fire seasons being tamer than 2015. 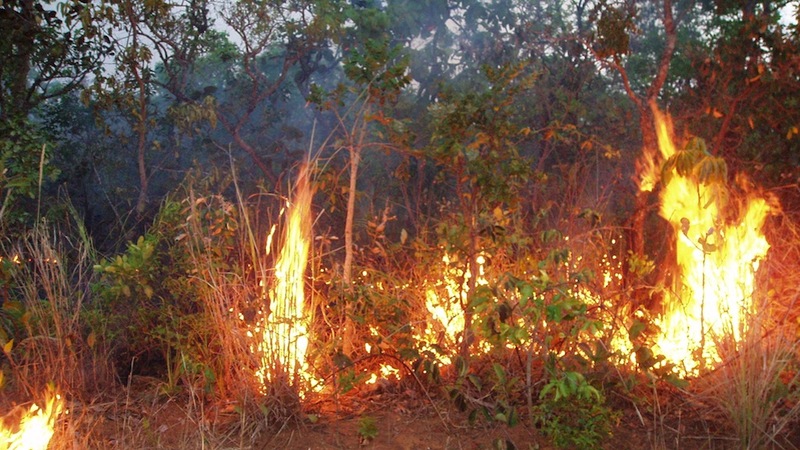 The fire season in the Amazon usually ends when the wet season begins in October. But while climate change can certainly exacerbate drought conditions, leading to more frequent wildfires, this year’s ferocious fire season might also have been heavily influenced by the El Niño event developing in the Pacific Ocean — which provides even more cause for concern about the 2016 fire season. Previous research by scientists with NASA and the University of California, Irvine has shown that sea surface temperatures in the tropical Atlantic and tropical Pacific oceans about three to six months before the start of the fire season — which runs from May to January, usually peaking in September — strongly correlate to occurrence of forest fires. Warmer ocean temperatures at the end of the Amazon’s wet season lead to reductions in rainfall and soil moisture at the beginning of the dry season, contributing to drought conditions. The western Amazon is impacted more by sea surface temperatures in the Atlantic, but the eastern Amazon’s fire severity risk correlates to sea surface temperatures in the Pacific. The NASA and UC researchers therefore predict a distinct east-west divide when it comes to fire risks in the Amazon Basin as El Niño heats up the Pacific. The forests of the western Amazon would experience average or below-average fire risk in the dry season, the team said, while the eastern Amazon would see above-average risk thanks to El Niño and rising Pacific sea surface temperatures. “As we’re building towards a moderate to strong El Niño, that places even more fire risk across portions of the central and eastern Amazon that are more sensitive to El Niño than to changes in the Atlantic,” said Doug Morton of NASA’s Goddard Space Flight Center. If the Pacific El Niño continues to strengthen, Morton and team expect fire risk to increase in the central Amazon, as well, and they may even be prompted to issue a fire forecast for the northern Amazon, which includes the state of Amazonas, for the first time. The fire season in the northern Amazon is different, Morton said, because peak fire activity usually occurs in February or March, so sea surface temperatures three months earlier, in October and November, have the most influence on fire risk. In other words, as the Pacific waters heat up, the forests of Amazonas could see thousands of fires again next year. “If the El Niño continues to strengthen, that’s a region that we will be watching,” Morton said.